“STOP DOING THAT!” “YOU DON’T LISTEN!” “I CAN’T BELIEVE YOU RIGHT NOW!” Some of the things that we as parents say to our children when we are frustrated or upset with them can affect their self-esteem and their opinion of you. 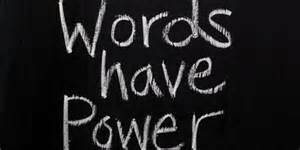 Our words are so powerful so we as parents and educators must choose them wisely and try to use positive language as much as possible. Using empathy is a great way of approaching a negative situation. What I mean by that is being able to take a breath and see what your child is trying to achieve or why your child is feeling that way. For example : “I can see that you really want to play with that toy but it belongs to the store and we can’t bring it home right now”. Putting yourself in their shoes will help you to manage in stressful situations. We would all like to be treated with empathy and respect and our children deserve the same. Using terms like “Don’t” or “Can’t” you are putting emphasis on the negative and this can hurt your child’s self esteem and sometimes it can have no effect in changing the behaviour. Take the terms and spin them into something more positive and you may get a better result. The best way to do that is to think about what you would like your child TO DO instead of what they should NOT be doing. For example: “Let’s walk” instead of “Don’t run” or “Markers are for colouring on paper” instead of “Don’t put markers in your mouth.” By using positive language instead of negatives, we are reinforcing what we want to see as the positive behaviour. This strategy will alleviate a lot of negative energy in your life. Children can really read between the lines and they can tell how you feel by the tone of your voice or the way you are delivering the message. Keep in mind that looking a child at eye level will allow them to feel on the same level as you are. No one is standing above and eye contact is key when you are expressing something important. Make sure you approach the situation in a calm manner. Panic creates more panic. Using positive language will not be as effective if your tone does not match the message you are trying to send. The majority of communication is non-verbal. Make sure your body is open and available so that you are welcoming a positive response. Empowering children is easy when you allow them the opportunity to prevent something from happening again. Give your child a chance to solve the problem or work with them to come up with a solution. Always make sure to follow-up with your child to check in on their feelings about what happened and to see if they understood the situation. This will empower your child in the future to create well balanced relationships. So the next time you feel frustrated with your child and are tempted to say something negative; take time to reflect and think how you can deal with the situation differently. At Alpha’s Preschool Academy, we strongly believe in positive language and redirection as our behaviour management techniques. Our educators provide behaviour management strategies to help parents develop stronger behaviour management and communication skills.